uPAC-7186EX is powered by a 80186-80 processor with 512K bytes of static RAM, and 512K bytes of Flash memory. It has one serial RS-232 port and one RS-485 port. Ethernet support is provided by a NE-2000 compatible controller with 16K bytes of on-chip buffer memory and 10Base-T media interface. The uPAC-7186EX also provides 14 user defined I/O lines. A cost-effective I/O expansion board with A/D, D/A, relay drivers and protected inputs is available. 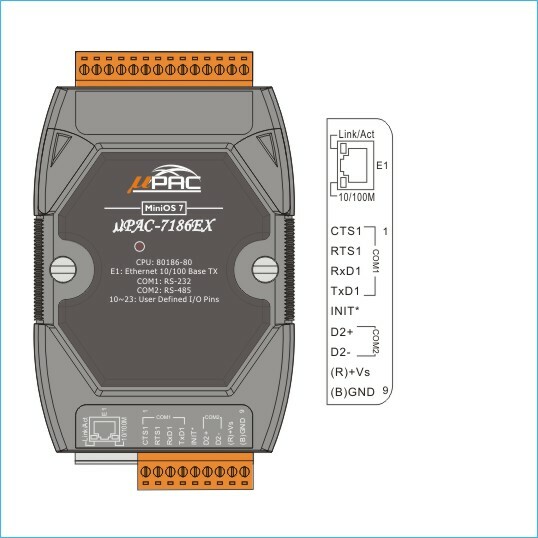 The uPAC-7186EX also supports battery back-up SRAM disk board and Flash-ROM board, providing non-volatile mass storage from 2 megabytes to 64 megabytes. The 10BASE-T port is equipped with a RJ-45 connector. 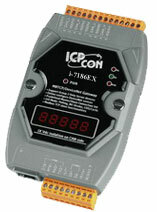 The 10BASE-T interface supports distances up to 100-meters (cable length) between I-7186EX and the network hub. Communication speed : 115,200 bps max.